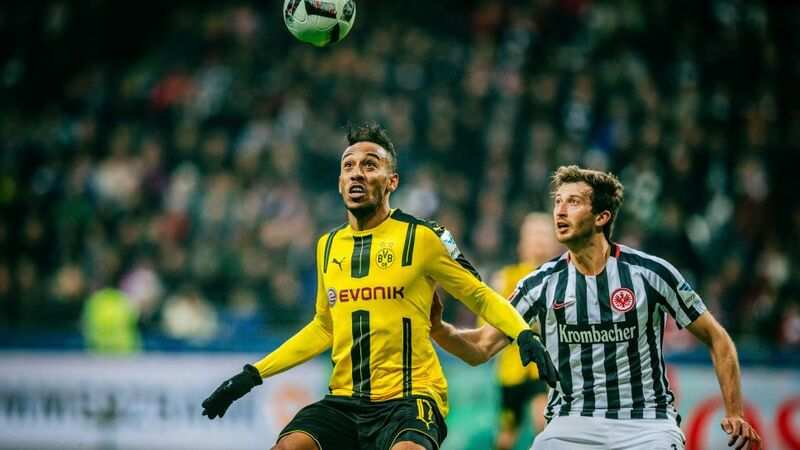 Pierre-Emerick Aubameyang (l.), the Bundesliga's top scorer in 2016/17, will face off against David Abraham of Frankfurt. And then there were two. Of the 64 clubs that competed in round one of the DFB Cup back in August, only Borussia Dortmund and Eintracht Frankfurt remain. Both are clubs with impressive pedigree in the competition, but only one can lift the trophy at Berlin's Olympiastadion this weekend. Ahead of the denouement to the 2016/17 German domestic season, bundesliga.com looks at five battles that could decide the victor on Saturday. Frankfurt's David Abraham will face few tests as daunting as shackling Pierre-Emerick Aubameyang in a cup final, particularly in the Gabonese’s current vein of form. Aubameyang picked up the Torjägerkanone award for the league's top scorer after netting his 30th and 31st goals of the season on Matchday 34, and also has seven goals in nine against Frankfurt. Abraham will need to call on all his experience to keep the 28-year-old under control. Whether he plays with Aubameyang or behind him, Marco Reus will surely have a say in the outcome of the game. The man for the big occasion, he scored at Bayern Munich in the semi-final and notched five in the last six league games of the campaign. Will Frankfurt's USMNT international Timothy Chandler be able to handle Reus' movement and lethal finishing? Key midfielder Julian Weigl is out with a broken ankle for Dortmund, giving Nuri Sahin an ideal opportunity to bring home another trophy for his hometown club. The 28-year-old has lent the team balance and control in Weigl's absence, but he will need all his tenacity to snuff out the threat of Marco Fabian this weekend. Frankfurt's Mexican midfielder scored four times in the season run-in, including an absolute rocket away at Borussia on Matchday 29. If he can find the ball in the right areas, he could make hay on Saturday. Both Thomas Tuchel and Niko Kovac have beaten the other this season, a fact that adds yet an extra layer of intrigue to this contest. Kovac set his team up to be compact and attack on the break in Matchday 12's 2-1 victory, while Dortmund had too much firepower for the Eagles in the return game in April. There is a healthy respect between the two – Kovac called Tuchel "a genius" in the press this week – but each is ruthless in wanting to succeed. Their management of the game, not the occasion, will be key. Finally, most observers will agree Borussia are favourites. They finished third in the table and beat the likes of Real Madrid this season, while Frankfurt ended up 11th, winning just three league matches in 2017. However, that means Dortmund have more to lose, a dangerous thought in itself but even more worrisome considering their recent history in the competition. Borussia are in a fourth successive final, but have lost all of the previous three, two of them on penalties. For the likes of Reus and Aubameyang, Saturday should in theory bring them their first end-of-season silverware in BVB colours, particularly with talent such as Ousmane Dembele and Christian Pulisic on the bench, but nothing is guaranteed.